Instantly joyful, this wonderfully Christmassy flower will light up the room. Very easy to stitch with bright clear patches of colour and nothing too complicated. 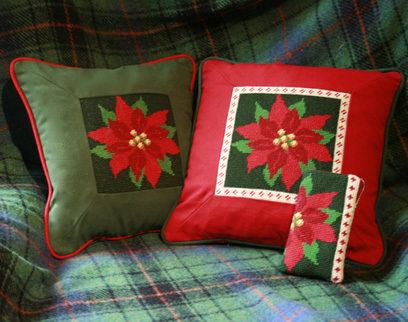 The Poinsettia can be made up as a Glasses Case (leave out the top and bottom borders) or as a Cushion as shown here in two ways with mitred fabric borders. Siesta Bar Frames are perfect for the Mini Flower range of Tapestries. Light and portable; just pin on the canvas and away you go.